We are holding a meeting on the Tuesday the 8th of November of the committee formed on the evening at Hunters. Anyone who would like to take part is welcome to join in and can email me at admin(at)rivervartry.com. We will post minutes of the meeting to everyone. An Taisce are organising a public meeting in Roundwood on Monday 16th November at 8pm at the Roundwood Community Hall. They have commissioned an experienced environmental planner to discuss the planning process and the plan. This plan is the umbrella plan for the area and is very lacking in regards to all the Rivers and specifically the Vartry. 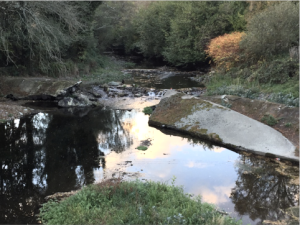 We need to have a submission drafted that will encourage the Wicklow County Council to discuss Rivers for other purposes than just Drinking Water! If anyone is interested please do attend and help us draft an observation to this important plan. The meeting was a great success and I personally would like to thank all of you for participating. There were over 40 people there, which considering there were a lot of people who had to cancel at the last moment, was a fantastic show of commitment and support. We talked about a Historical Approach to getting more water in the river and a Scientific Approach towards monitoring and enforcing EU Regulations. This did spark interest and the consensus was to continue to pursue these and increase the effort. This is a unique body of neighbours which I believe has never been assembled before. The joining of forces of Riparian Owners and Surrounding Neighbours joining together to protect the river. A corridor of safety to the habitat and River which flows though all of our area. The shared Rights and Responsibilities of Riparian Owners were discussed and the basis of this in Common law which can dictate how we would like the River to Remain. We will be producing a summary of the meeting but in general there were several important points. There were volunteers to make up a small steering group that will help administrate. There is a volunteer to help with grants and grant applications who is a professional in this field, and has already reached out to help. There is a member will be investigating whether there is a University that might be interested in conducting some research for us.